New England Patriot superstar Rob Gronkowski's new streaming show matches entrepreneurs with all-star athletes. Let the games begin! If you’re a New England Patriots fan jonesing for a little Gronk in your life, we’ve got your fix. 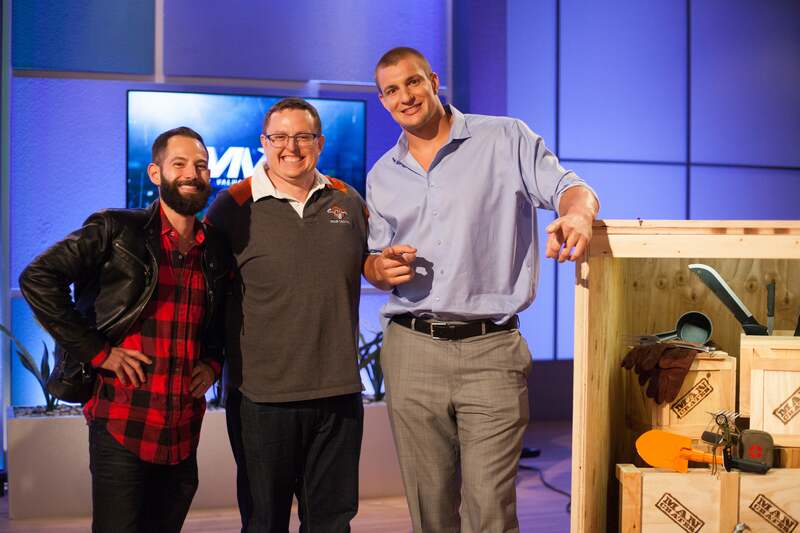 While sadly, NFL superstar tight end Rob Gronkowski's back injury will keep him off the field for Super Bowl LI, you’ll get to see him in action tonight on a new show he produces and stars in called MVP (Most Valuable Partner). MVP finds Gronk and a panel that features an incredible array of professional athletes such as Kevin Durant, Terrell Owens, Triple Crown winning jockey Victor Espinoza and Olympic softball gold medalist Jennie Finch being pitched by entrepreneurs to become their business’s brand ambassador. All episodes of the 18-part series can be streamed Wednesdays on go90.com or the go90 app. Check out the first episode here. Did the idea for this show come from the fact that people pitch you crazy ideas all of the time? Yeah, people pitch me crazy ideas no matter where I am. Friggin’ if I’m out and about with friends at a sporting event or dinner, I have people coming up to me with stuff. I’m just trying to have a good time, man, it’s not really a good time to talk business! But I love business. It’s in my blood. So I love on this show that I get to meet these entrepreneurs in person, try their products, ask them the tough questions and it’s all with a fun, competitive edge to it. It’s super exciting. How does Football Gronk compare to Business Gronk? If Business Gronk was as good as Football Gronk, I’d probably wouldn’t even have to play football! Business is in my blood, my dad started a fitness equipment business 25 years ago that is still going strong. We actually branched off from it and started Gronk Fitness, which sells workout accessories. My brother runs that part of the business. We actually had both of my brothers on to pitch their businesses, which was really fun. Do you give your brothers a break or do you go extra hard on them? Oh man, I went extra hard for sure! What’s the thing that you hate and the thing that you love when someone is pitching you an idea? I hate people overselling. How this idea is going to explode and everyone is going to be using it. You need to be realistic. I hate when someone says you’re going to make millions in three weeks. It just sounds so unrealistic. Too good to be true. I hate that. I like realistic business ideas pitched by people who understand that you have to work hard for a long time to build something. I want to hear from someone with a plan who has a plan behind that if something fails. Who would win in a game of beach volleyball: your panel of experts or the crew from Shark Tank? Definitely my panel of experts! If you put these athletes against those guys, we'll dominate. Would you spike it in Mark Cuban’s face? I’m sure he’s super competitive, but I feel like if I got set up well, got a good jump and a good follow through, anything can happen. A business person that has an idea and the smarts to bring it to the next level. In sports and in business, is there something that you do to get yourself in the right mindset to overcome adversity? I feel like everyone who has played sports at any level knows what it is like to come together as a team with one mission in mind. Sports give you that mindset to “get it done,” which you need in the business world. Do you find that more and more guys in the locker room are thinking about life after football? When you first get into professional sports -- NFL, NBA, hockey, whatever -- you feel like you’re going to play forever. I felt that way for sure when I started. But now that I’m in my seventh year, going on eight next year, I definitely see it ending one day. I don’t know when it’s going to be, no time soon and I wish it were never. But being realistic, it is going to happen and I do see myself taking the time to think about business ideas to set myself up for when I’m done playing. I’m not the type of person who wants to sit around not doing anything. So my son Henry loves you but hates the Patriots. Can you suggest a good counselor to help him deal with these conflicting emotions? Ah man, he should just convert to a Patriots fan overall! Just do that, make life easy, he won’t be stressing over anything. Have you had a mentor who made a big difference in your life as a leader? Being here as part of the Patriots organization has helped me become the man I am today. Just being around players like Brady and coaches like Josh McDaniels, Bill Belichick, Matty P. -- guys like that who show what is like to put in hard work and find success. And, of course, the team owner Mr. Kraft who is a just a great leader and a great man. So what you’re saying is that you are going to leave the Patriots and go to the Jets, right? Man, if you got that out of everything I just said, that’s impressive! But we cleared that all up already. Your son is going to be a Patriots fan. It’s agreed on!